Julie's Boyz: I'm not giving up alcohol for Lent! So the inevitable question with Lent approaching in our house ... what are you giving up for Lent? Many people see no point to this process but I always believe that practicing a little self restraint once a year is a good thing. Even if faith were not part of the equation, what is wrong with exercising a little control? So for a moment let's not debate the reasoning but rather accept that it is something that happens in our house. 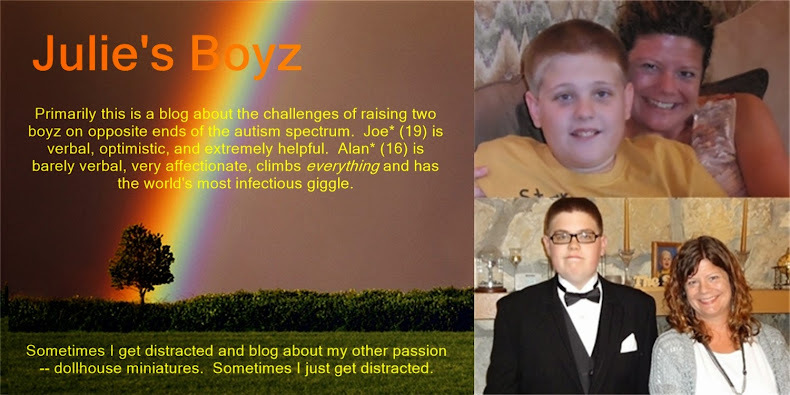 Since Joe was old enough to understand the concept, we have been trying to encourage him to give something up. One year all we could talk him into was giving up toast. OK, he was in the habit of having toast several mornings a week then but still it was not what most of us would call a sacrifice! Mom: Maybe you should consider limiting your movies for Lent. Joe: You mean I can just limit something instead of giving something up? M: Well if you limit yourself to just one one video on school days and two on weekends it would still be a sacrifice. J: But what if I wanted to watch more than that? M: Well that is where the sacrifice part comes in. J: OK, I'll only watch 5 movies a day. M: FIVE? Joe, you don't watch 5 movies most days! Clearly the concept of sacrifice and denial needs some work! One year he decided to give up his favorite mouthwash for Lent. Granted at this time the other stuff I had purchased did taste fairly nasty but still trying to explain this concept to Grandma was a hoot. As DH and I were having our inevitable conversation this year DH stated, "All I know is that I'm not giving up alcohol for Lent!" Hmm, he might have something there. I gave alcohol one year for Lent. I was pregnant. This year I 'tried' to give up Diet Coke. And was not quite as successful. I asked Allie what she was giving up for Lent and she told me that she really didn't see the point since God loves her anyway.